Why Breathe Out of the Nose When Swimming? When it comes to breathing while swimming, timing is everything. Without proper technique, you’ll be holding your breath or gasping for air, creating a choppier flow that will reduce your swimming speed. Breathing out of the nose allows you to continue stroking evenly, maintaining a constant breath pattern. However, it's also possible to use a combination of breathing out of the nose and the mouth in an alternating pattern. You should always be exhaling while swimming, except when you turn your head above the water in order to inhale, according to SwimSmooth.com. Technically, you could breathe out of the nose or the mouth, but breathing through the nose reduces the chances that you will swallow water and creates less drag. To exhale through the nose, keep your face in the water and let a stream of bubbles slowly release from your nostrils while you continue to stroke. One challenge with breathing out only from the nose when swimming is that it can be harder to expel all of the air in your body; sometimes using the mouth allows you to breathe out more forcefully, according to the website The Swimming Expert. Beginning swimmers tend to hold their breath longer, perhaps thinking this will allow them to cover more of their pool lengths before gasping for air. One mistake is to take a late exhale through the mouth right when the swimmer is surfacing for a next inhalation. Swim coaches can watch for a little spray of water near the mouth when swimmers mistakenly use this breathing technique, according to SwimSmooth.com. Holding your breath makes your body feel tense, reducing the ease of swimming through the water. It also keeps too much carbon dioxide in your body, making the lungs and blood stream feel uncomfortable and creating a sometimes-desperate feeling of needing to breathe. Finally, refusing to exhale keeps your chest too buoyant in the water, since your lungs are filled with air that needs to be released. On land, most people are accustomed to breathing in a one-to-one ratio, with the inhale and exhale of approximately the same length. This doesn't work as well in the water, since your body's swimming momentum will likely cut off the exhale before it's fully finished, according to the Manitoba Marlins article, "Breathe Better--Swim Faster." A better ration is two-to-one, with the exhale lasting twice as long as the inhale. With practice, some swimmers can achieve a three-to-one ratio. Ratios can also vary depending on the swimming stroke; for example, in freestyle swimming you breathe every three strokes. You can alternate mouth and nasal exhalations instead, sometimes getting a longer exhale through the mouth to maintain the breathing pattern. If you prefer to breathe out from the mouth, it’s not something to worry about. 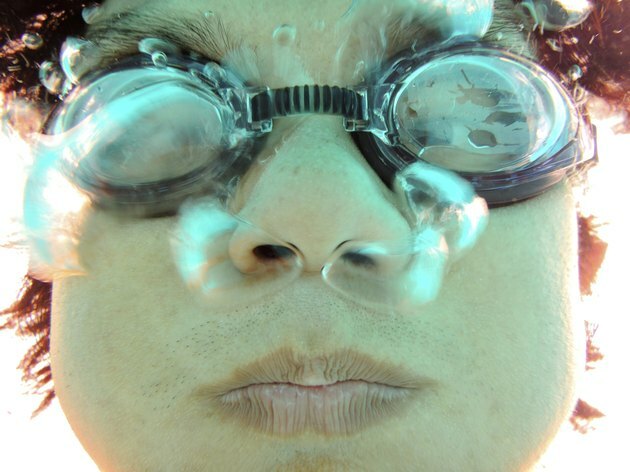 Plenty of swimmers choose to breathe out of the mouth; in fact, you can purchase nose plugs to keep water from entering the nostrils if desired. You might also choose to use a combination of mouth and nose for powerful exhalations when surfacing from the water, according to Human Kinetics. The Swimming Expert: How to Breath Correctly in Freestyle? Should You Wear Nose Plugs for Swimming?